Custom printed wallpaper or vinyl can immediately transform a space from drab to dramatic! 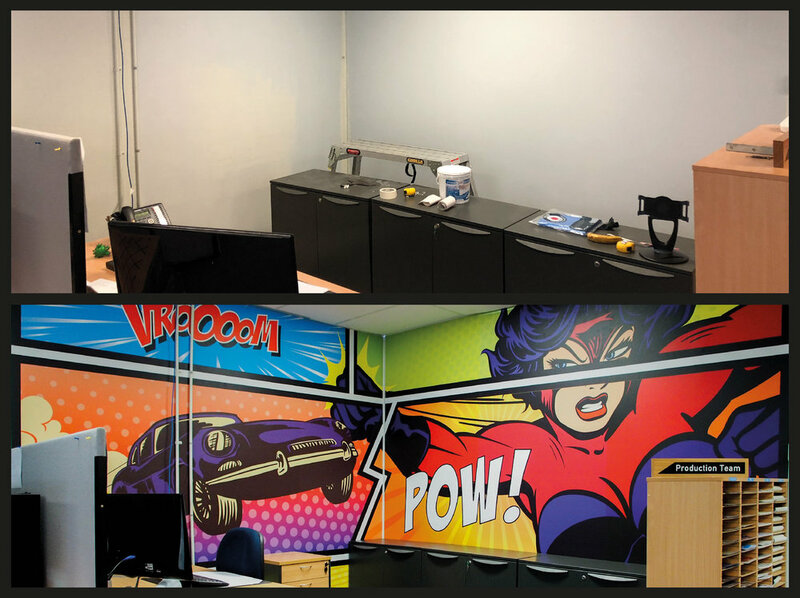 As you can see above we had a bit of fun dressing up the dull corner that is occupied by our head of production and as this is such a prominent space we wanted something fun but had to think carefully about our colour selection - here's why. As well as brightening up an office space a thoughtful colour selection can have a lasting positive effect on staff productivity. Although each colour has a separate appeal we thought we would look into the psychology of colours in a workplace and how they can benefit our production team in the long term. The colour red, can encourage feelings of excitement that increases brain activity which is great, however when choosing this colour it should be used as an accent and not a feature as an over saturation of this shade is known to have the adverse effect. Orange and yellow are seen as happy colours and can energise employees which influences productivity. Yellow invokes a welcoming atmosphere and encourages us to tap into our creative sides while orange breeds enthusiasm. Again however when using these colours they too have a more positive effect when used in moderation. While using blue and green help you feel calm and relaxed they can also create the feeling of sadness when using darker hues so it is highly recommended to steer away from including large areas of deep, dark, cool tones. Finally, purple is a colour that creates a great impression when entering a room and is also known for encouraging imagination - a colour that we definitely wanted to incorporate in this design. We love how this graphic turned out and hope that it inspires some of you to take a look at your own work space and see how adding a splash of colour within your line of sight might change your level of focus throughout the day!